Future Cities Canada is a national cross-sector initiative with the mission to accelerate innovation to transform cities for the benefit of all. The Future Cities Canada Summit takes place November 7-9 at Evergreen Brick Works in Toronto. 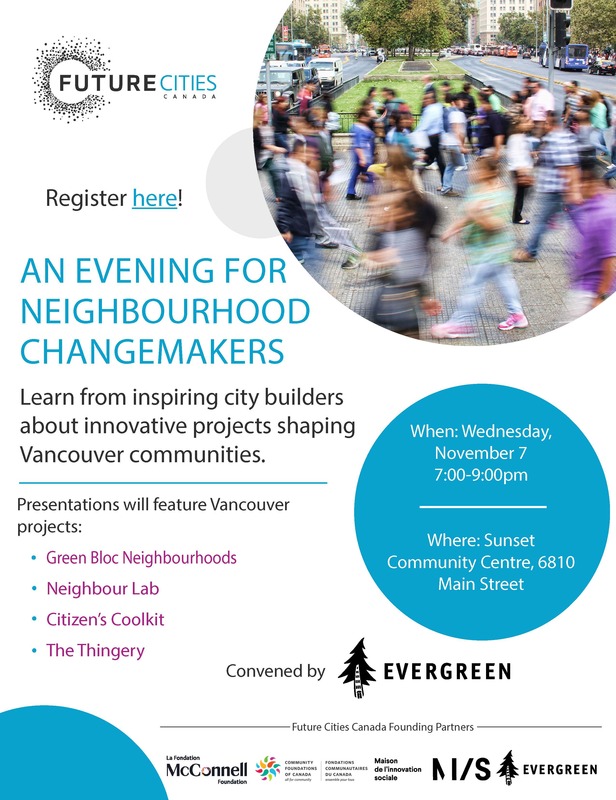 In Vancouver, Evergreen BC will be hosting our very own Future Cities Canada Event: An Evening for Neighbourhood Changemakers. This event will convene community organizations in Vancouver that are working at the neighbourhood level to catalyze people, ideas, and activities to build healthier, more sustainable, and resilient communities. Our presenters for the evening will include Neighbour Lab, Citizen’s Coolkit, and the Thingery. Each group will present their innovation in a workshop setting, fostering learning and knowledge exchange with participants about leading neighbourhood practices shaping Vancouver's future. These neighbourhood level actions engage citizens in building community resilience, promoting climate adaptation, and reducing environmental impact. This is a public event, and all are welcome! Light refreshments and snacks will be provided. Free. Registration on Eventbrite qualifies you for entry. Please only register to confirm attendance. Join Evergreen to explore, learn and plant in Mahon Park on Earth Day.